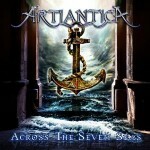 Share the post "Album review: ARTLANTICA – Across the Seven Seas"
New band in name, although they have morphed out of Angel of Eden who released a cracking album ‘The End Of Never’. That line-up featured former Royal Hunt vocalist John West, keyboards wizard Mistheria and guitarist Roger Stafflebach (Stafflebach and West were also members of Artension). This trio are joined by former TNT drummer John Macaluso and a couple of guests including Savatage’s Chris Caffery. This is well played and highly catchy melodic metal with a progressive edge. There are no real epic songs although the instrumental ‘Return of the Pharaoh Pt. III’ allows Mistheria and Roger Staffelbach to trade solos. The speed at which Mistheria plays his keyboards means they sound almost like a second guitarist. The title track and ‘Devout’ are instant hits on the ears, sounding not unlike say Royal Hunt with lashings of keys and backed by big guitar riffs. John West still has that vocal power required in a band like this, although he shows his softer side on the ballad ‘Ode To My Angel’. A lovely song that gives the listener a little breather! Not as instant overall as the Angel of Eden album, although with more plays I am sure it will grow and grow in popularity for me. Strong songs and top draw musicianship make this another for you ever growing shopping list. This entry was posted in ALBUM REVIEWS, ALBUM REVIEWS (Mobile), All Posts and tagged Across the Seven Seas, Album ARTLANTICA. Bookmark the permalink.